A Georgia Tech-led discussion in Washington, D.C., looked at how colleges can meet students’ needs throughout their entire lives. Sep 6, 2018 | Washington, D.C.
As the needs of students and employers continue to change rapidly, higher education must adapt. 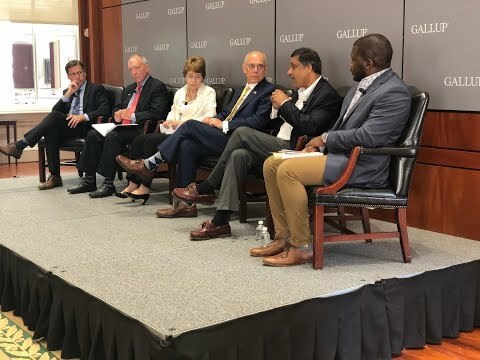 What those changes will look like was discussed during a Georgia Tech-led panel held Thursday in Washington, D.C. The audience of more than 50 people included reporters and representatives from foundations, think tanks and congressional staffers. The event opened with a fireside chat focused on Georgia Tech’s “Deliberate Innovation, Lifetime Education” report. Wall Street Journal reporter Melissa Korn talked with Provost Rafael L. Bras about how the university of the future might look. Georgia Tech’s roadmap for that change is a report released last spring. Using the year 2040 as a vantage point, it envisions a university that provides an educational experience that can be personalized as professional interests and needs shift throughout a person’s life. The report looks at ways to improve advising, how to use artificial intelligence to personalize education, and what new products and services will make it possible to meet demand as learners’ professional and personal needs change. Adam Harris, a reporter with The Atlantic, moderated the discussion which touched multiple topics including the need to educate the whole person and evolving in response to students’ demands and the shifting labor market. They highlighted the importance of affordability, access and excellence. They explained how modular offerings through certificates and minimesters will benefit more students. And they talked about how to overcome impediments to innovation.